Here's a quick polyshrink bracelet made with the Baroque Motifs set. Images are stamped with stazon on polyshrink - after they are dry, cut them with the 1" square punch, and shrink with your heat gun. I like to place my craft sheet into the bottom of an old shoe box to heat my polyshrink - when it's done shrinking, I press it firmly with a wood block to make sure that the plastic is even. Then edge your pieces with a Gold Krylon Pen. Let dry. Spray pieces with Krylon Triple Thick Clear glaze, let dry. 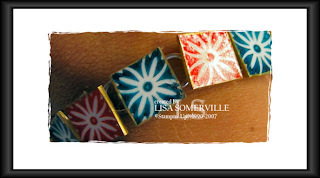 Adhere to your bracelet blank using super glue. Wow! I love this! I want this! Great job! THIS is something I will HAVE to try this summer!! I've got tons of the polyshrink from SU! Beautiful bracelet!!! thanks for sharing how you did it. Wow, very pretty, the gold edges is a hot tip! Gold makes everything look good. Thanks for sharing.